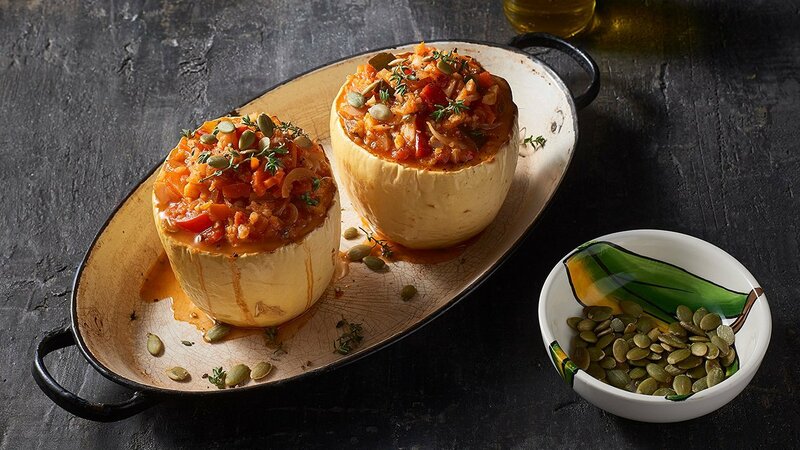 North American spaghetti squash, hulled, baked, filled and served. A vegetarian meal done different and enjoyed by everyone. Add cauliflower and vegetables and sauté for around 2 minutes. Add in KNORR Italiana Tuscan Vegetable Sauce. Cook, stirring occasionally, for 20 minutes or until cauliflower is tender. Cut in half and scoop out seeds and a little flesh. Place on a baking tray. May need to trim bases to ensure they sit on the tray. Spray with oil, season and bake until just soft. Remove from oven and fill with vegetable mix.